Have you checked your headlights recently? A few days ago I got into my car to go home in the dark and as I pulled away from a traffic light, my left dipped beam headlight bulb blew. To begin with it didn’t occur to me that there would be any link between the bulb blowing and the cold. As this cold snap has now become prolonged for what we have normally come to expect in the UK, I have noticed that there are a significant amount of cars driving around with blown bulbs – many more than you would normally see! Temperature changes can impact on the filament inside your headlight bulb. The filaments have a life span as it is, but the cold weather can cause the bulbs to burn out faster. 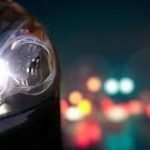 It is worth checking that your headlights are fully operative ( If they are blown it would be an MOT failure) – if you find that a bulb is blown then pop down and we will be happy to replace it for you.